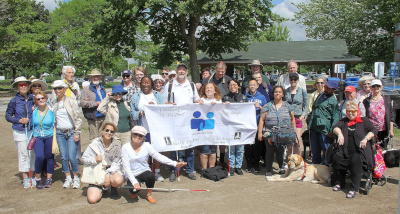 The CCB Toronto Visionaries chapter is committed to strengthening the informal social networks essential for gaining the skills, knowledge and social contacts needed for those with vision loss to live a full, rich life. In supportive group settings, our members are encouraged and inspired by their peers, allowing them to explore recreational, social and educational opportunities they once thought were beyond their reach. Through our outreach programs, we're building bridges between the vision-loss and sighted communities, breaking barriers by bringing an understanding of the impact of vision loss to a wider public. Blindness often increases social isolation, and many people living with vision loss feel further isolated by economic barriers, as many live on extremely restricted incomes due to their disability. The funds we raise are used to provide information about supports and services, and to break isolation by lowering the economic barriers to full participation in many common social activities. The CCB Toronto Visionaries is entirely organized and operated by volunteers. We have no salaried employees, no office space, no overhead. So, the benefits our members realize come directly from donors like you. And, as a chartered chapter of the Canadian Council of the Blind, (registered charity number 119218899RR0001), donations of $20 or more are eligible for tax-creditable receipts. Press PayPal button below, to donate using a credit card or your PayPal account.